At the invitation of Premier Li Keqiang of the State Council, Chancellor Angela Merkel of the Federal Republic of Germany will pay an official visit to China from May 24 to 25. Q: According to reports, US President Trump said that it might be the second meeting between Chairman Kim Jong Un and President Xi Jinping that led to the DPRK's change of attitude on the Korean Peninsula issue. What is your comment? A: I am not sure whether you are quoting President Trump's words as the way he said them. In fact, President Trump has been saying a lot on the Korean Peninsula issue, including on the upcoming US-DPRK summit. As for China's role on this issue, I believe everyone is clear about that. First, our proposal and position on the Korean Peninsula issue remain consistent. The other parties may have changed their positions in one way or another, but China's position has never changed. We are committed to realizing the denuclearization of the Korean Peninsula, maintaining peace and stability on the Korean Peninsula, and peacefully resolving the Korean Peninsula issue through political talks between all relevant parties. 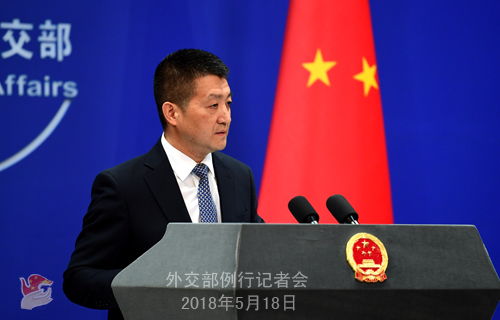 We have been reiterating over the past few days that China is pleased with the recent momentum of dialogue and détente on the Korean Peninsula, and we encourage a continuation of this momentum. We believe that all relevant parties should seize the opportunity, meet each other halfway, and make concerted efforts to consolidate the improving situation on the Korean Peninsula and bring the issue back to the track of settlement through dialogues at an early date. Q: Just now you announced German Chancellor Angela Merkel's upcoming visit to China. How many visits has she paid to China? What topic will be discussed? A: This will be Chancellor Angela Merkel's first visit to China after her reelection and her eleventh visit to China in the capacity of the German Chancellor. During the visit, President Xi Jinping, Premier Li Keqiang and other Chinese leaders will meet and hold talks with Chancellor Angela Merkel, during which they will have an in-depth exchange of views on China-Germany and China-Europe relations and cooperation as well as major international and regional issues of common interest. As far as I know, the China-Germany Economic Advisory Committee will also hold meetings. Besides Beijing, Chancellor Angela Merkel will visit Shenzhen. In recent years, China-Germany relations have been developing with a sound momentum, as evidenced by frequent high-level exchanges, fruitful practical cooperation, numerous highlights in cultural and people-to-people exchanges and closer coordination and cooperation in international and regional affairs. China highly values its relations with Germany and stands ready to elevate bilateral relations and across-the-board practical cooperation which are already operating at a high level on the basis of mutual respect, mutual benefit and win-win outcomes. We are convinced that with concerted efforts, this visit will further step up our political mutual trust, advance bilateral cooperation in various areas and inject new impetus into the growth of China-Germany relations in the new era. Q: US President Trump said on May 17 that the Libyan model isn't what the US is looking at when seeking the DPRK's denuclearization. If the DPRK leader agrees to denuclearize, the US would offer security guarantees and very strong protection to the DPRK. There are also reports saying that when meeting with DPRK's Supreme Leader Kim Jong Un, US Secretary of State Pompeo said that if the DPRK agrees to complete, verifiable and irreversible denuclearization, the US would consider offering guarantee to the DPRK and including that stance in a joint statement. What is your comment? A: These statements showed that the US side takes the DPRK's security concerns seriously and would like to address these concerns. China welcomes that. We have said many times that the Korean Peninsula nuclear issue is essentially a security issue. Amid efforts to promote the denuclearization of the Korean Peninsula, the concerns of all parties, including the legitimate security concerns of the DPRK side, shall be addressed in a balanced way. This is also an integral part of the September 19 Joint Statement of the Fourth Round of the Six-Party Talks in 2005. We are pleased that the US chose to look at this issue squarely. This is a right attitude. China maintains that the political settlement of the Korean Peninsula issue shall be realized in phased and synchronized steps with a package plan. Each phase brings along corresponding responsibilities and obligations for all relevant parties. This could ensure the sustainability of the political settlement process of the Korean Peninsula issue. China will continue to encourage the US and the DPRK to meet each other halfway, build mutual trust, address each other's concerns through dialogues, and make joint efforts to advance the political settlement of the Korean Peninsula issue. 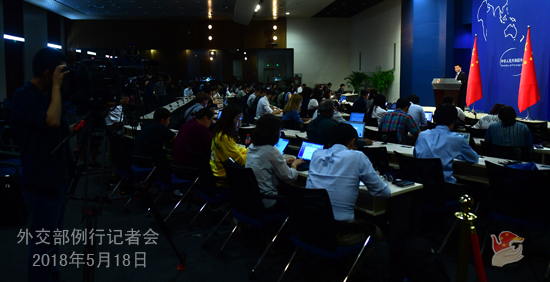 Q: First question, US officials said on Thursday that China proposed in this round of negotiations to reduce the US trade deficit by $200 billion a year, which is similar to what the US asked for in the first round of negotiations. Can you confirm it and comment on it? Second question, the Commerce Ministry of China announced to drop its anti-dumping and countervailing probe into US sorghum imports. Some believe that this indicates China's posture in the current negotiations. What is your comment? A: Regarding your first question, what you just said is a rumor and is not true. As far as I know, the relevant consultations are still in progress and are constructive. Regarding your second question, the announcement issued by China's Commerce Ministry this morning incorporates comprehensive details, including the considerations behind making this decision. This is an authoritative statement from the Chinese government. There is no need for other parties to make unnecessary associations and interpretations. The question you raised is about the fact that China and the US have to resolve their respective concerns. I said earlier that trade should be conducted on the basis of consultations. China and the US are two large economies with pretty close economic and trade ties. It is inevitable for us to have some different views and opinions and come across some issues. Consultations are meant to address each other's concerns, increase mutual understanding, and work toward compromise. Q: First, according to reports, President Trump said that Chairman Kim Jong Un's change of attitude may have been the result of influence by President Xi Jinping. What is China's response to this? Second, regarding Vice Premier Liu He's visit to the US to discuss China-US economic and trade issues, President Trump said that he hopes China will expand its market access for energy and agricultural products. Does this mean that China has made greater concessions in this round of consultations? A: As for the first question, the Yonhap News Agency reporter has already asked about it. China's position on the Korean Peninsula issue is very clear. I just reiterated it. In terms of any influence or role the Chinese side has exerted or played, it is that China has been actively encouraging and persuading all relevant parties, especially those directly involved in the Korean Peninsula issue, to meet each other halfway and take practical measures to accumulate mutual trust in order to create conditions for the resumption of dialogues. We are very glad that the Korean Peninsula has indeed seen a period of dialogue and relaxation. What I can tell you is that in the future, the Chinese side will continue to make its own efforts to promote dialogue and détente. Regarding your second question, we have also noticed some opinions voiced by the US side on the current round of economic and trade consultations. Some of them came from President Trump, and some were said by US officials. Just like what I said in response to the previous reporter's question, the consultation itself was to resolve some concerns between the parties. I also said just now that as far as I know, the relevant consultations are constructive. We hope to resolve some of the concerns of the two sides through such consultations so that we will give a better play to the nature of mutual benefit and win-win outcomes of China-US economic and trade relations. Q: According to reports, on May 16, US Senator Marco Rubio said at a hearing of the Senate Foreign Relations Committee that Paraguay may be the next country to cut off its "diplomatic ties" with Taiwan. The spokesperson of the US State Department recently said that the Dominican Republic's severing of its "diplomatic ties" with Taiwan unilaterally changed the status quo and was not conducive to upholding regional stability. Officials from the US State Department also admitted that the US side had told the Dominican Republic not to cut off its "diplomatic ties" with Taiwan. What is your comment? A: China stands ready to develop friendly cooperative relations with other countries around the world on the basis of the Five Principles of Peaceful Coexistence and the one-China principle. Since last year, China has established diplomatic ties with Panama and the Dominican Republic. It once again demonstrates that the one-China principle has been universally acknowledged and endorsed by the international community. As a principle of righteousness, it corresponds with the will of the people and the irresistible trend of the times. We are strongly dissatisfied with and firmly opposed to the above-mentioned remarks by the US side. The US established diplomatic ties with the People's Republic of China in 1979 and acknowledged in the three China-US Joint Communiques that there is only one China in the world and that the government of the People's Republic of China is the sole legal government representing the whole China. So, it baffles us as to why the US side wants to prevent other countries from recognizing the one-China principle and normalizing relations with the People's Republic of China? 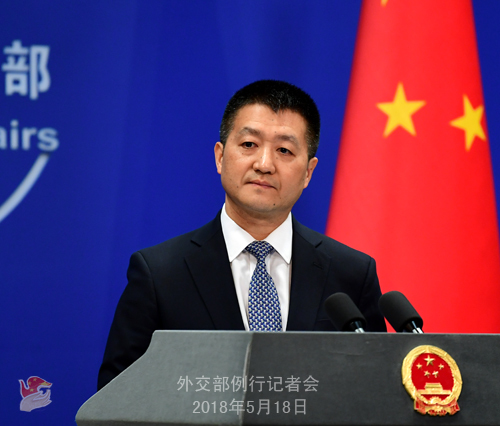 We urge the US side to abide by the one-China principle, honor the clauses and its commitments in the three China-US Joint Communiques, refrain from making irresponsible remarks at other countries' decisions to develop ties with China, and stop exploiting cross-Straits relations to interfere in China's internal affairs. Q: So just to be clear. You mean that China did not offer to the US to cut deficit by 200 billion dollars because the talks are still ongoing? What did China tell the US that made them misunderstand or misconstrue this? A: The question raised by CNN just now was about US officials claiming that China has raised the relevant proposal. I said that it is a rumor and not true. With regard to what has been proposed by the two sides during the consultations, we cannot give you any details at the moment, because the consultations are still underway. Let us wait in patience. As to how the consultations have been proceeding, I have said just now that they are constructive. Q: According to reports, recently, the Spanish side repatriated two Taiwanese telecom fraud suspects to the mainland. The Taiwanese department in charge of its so-called foreign affairs voiced strong protest over this, claiming that the mainland "forcibly interfered in and imposed pressure on" Spain's court trial process. What is your comment? A: China highly appreciates the Spanish government's adherence to the one-China principle when handling the Taiwan-related issues. We are pleased to see that with the deepening of political mutual trust and solid progress in practical cooperation between China and Spain, more fruitful outcomes have been achieved in cooperation on combating crimes and conducting joint law enforcement operations. As to some comments made by certain people in Taiwan, it falls within China's internal affairs and I would refer you to the competent authority, namely, the Taiwan Affairs Office of the State Council. Q: According to reports, on May 17, the Communist Party of Nepal (Unified Marxist-Leninist) and the Communist Party of Nepal (Maoist Center) merged to form the new Nepal Communist Party. What is your comment? A: As a good neighbor and good friend to Nepal, China supports Nepal in independently choosing the social system and development path that suit its national conditions. We welcome the merger of the two parties and hope that Nepal can achieve its national development goals at an early date. China stands ready to deepen mutually beneficial cooperation with Nepal to deliver greater benefits to our two countries and two peoples.